20228 - Perfect for two adorable flower girls or ring bearers to carry together! Can also be hung as ceremony decor. 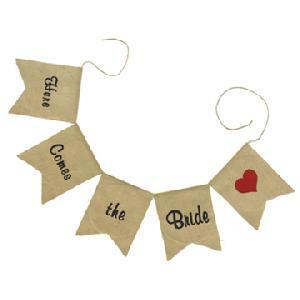 Five-piece pennant banner with wording "Here Comes the Bride". Made of 100% natural jute fabric. Each pennant measures 10" x 8". Includes jute cord for assembly. Embroidered in black and red thread. © 2017 Elan Wedding Consultants Inc.